Cambridge, Massachusetts based startup Joule Biotechnologies is developing a new process using solar power to derive a biologically-based fuel without growing any crops or using any plant matter. Their process converts carbon dioxide directly into a liquid fuel and could yield up to 20,000 gallons of usable fuel per year per acre of land for approximately the same cost as an equivalent amount of fossil fuels. 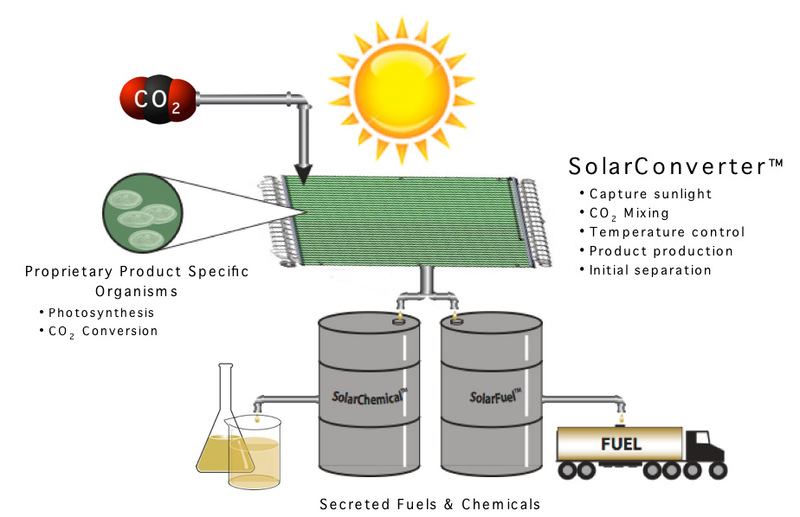 The Joule Biotechnologies process, called Helioculture, consists of a solar converter that captures sunlight and carbon dioxide, turning them into a liquid biofuel. The converter contains an internal broth of gray water, nutrients, and genetically engineered organisms that use photosynthesis to secrete hydrocarbons that can be used as fuel. The system is completely modular; scaling up the process involves adding additional solar converter units. Many of the traditional problems of biofuels and solar power are avoided by the Helioculture process. It requires significantly less land than corn-based biofuels and also doesn’t require agriculturally viable land to operate. It also avoids the expense and lack of scalability of algae-based biofuels. Furthermore, the resulting liquid fuel has a greater power density than solid solar cells and can be easily transported without any power degredation. Most of the specific details of the Joule Biotechnologies process are still unknown. The specific organism used to secrete the fuel has not been revealed (beyond a statement that it is not any form of algae). No indication of further processing needs or methods for integration with traditional fuels or power consumers are available. Initially laboratory testing has been completed and Joule Biotechnologies is initiating plans for a pilot plant somewhere in the Southwestern United States. If all goes well, they hope to have commercial ethanol production in place by 2010 and commercial hydrocarbon fuel production in place by 2011. In addition to liquid fuels, Joule Biotechnologies is also using solar power to generate chemicals for a variety of industrial uses. TFOT has previously reported on other biofuels including genetically engineered bugs (based on E. coli bacteria) capable of excreting fuel that’s very similar to crude oil, a new process that turns garbage into ethanol, and new batteries that draw their power from simple carbohydrates such as sugar. TFOT has also reported on tests of various biofuels including an Air New Zealand jetliner that flew using jatroba fuel in three of its four engines and tests of a Rocketdyne engine using biodiesel fuel instead of traditional fuels. Read more about plans for the Helioculture process in this Joule Biotechnologies press release and more about how it works in this informational page.